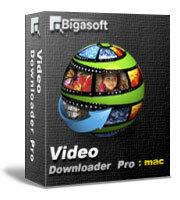 Just free download Bigasoft FLV Converter for Mac and enjoy a whole new world of funny YouTube videos right now. 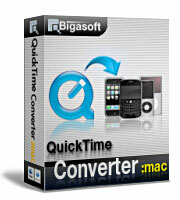 Ready to try or buy Bigasoft FLV Converter for Mac? 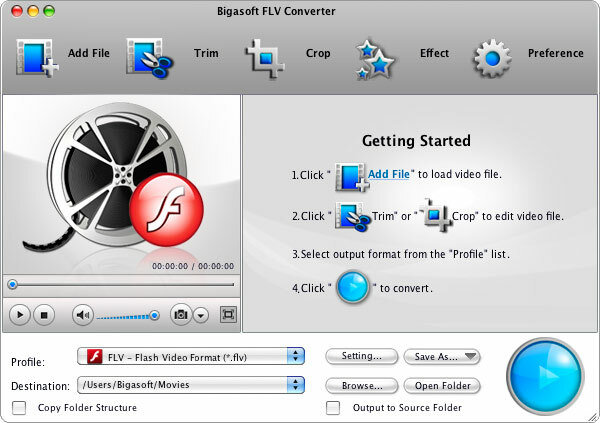 Bigasoft FLV Converter for Mac helps fast convert Mac FLV to any video format such as AVI, Xvid, DivX, H.264, MP4, MOV, WMV, MPEG, MPG, MKV, 3GP, RM, and more for watching unlimited funny YouTube HD movies. 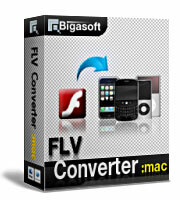 It can also be used as a Mac FLV to MP4 converter to convert FLV for Mac users. Convert YouTube videos direct to your Mac OS X and various devices including iPod, iPhone, iPad, BlackBerry, Apple TV, Zune, Zune HD, PSP, PS3, Creative Zen, Xbox, Archos, and so on for taking funny YouTube movies with you. The professional Mac YouTube converter allows you to play and preview movies before converting. Batch conversion function allows you to convert multiple FLV and MP4 files at one time with just one click. The powerful Mac FLV converter allows you to manage output video size by adjusting Resolution, Bitrates, and more. The wonderful OS X YouTube converter can smoothly run on Mac OS X v10.4(Tiger), 10.5(Leopard), 10.6(Snow Leopard), 10.7(Lion), 10.8(Mountain Lion), and 10.9(Mavericks). Mac OS X v10.4(Tiger), 10.5(Leopard), 10.6(Snow Leopard), 10.7(OS X Lion), 10.8(Mountain Lion), or 10.9(Mavericks).